Which cartridge size do you need? 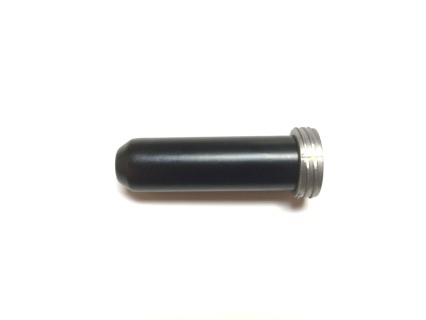 You can compare the dimensions of your cartridge to our empty cartridges here! Then match the gun size to your cartridge size. The 1/10th gallon is the most common size found in a hardware store, but sometimes the packaging is unclear or only provides weight on the label. 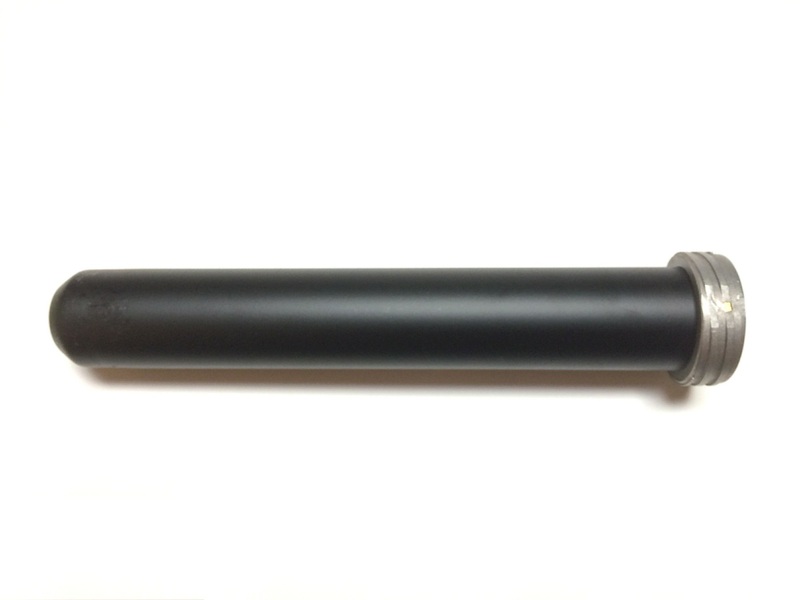 All of our guns are built to match our cartridges, but also work with most cartridges available on the market. Please make sure you contact IDS if you have questions. 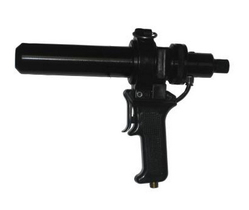 The Handler Manual Cartridge Gun (shown above) accepts the same threaded retainers (shown below) used in our Pneumatic version. Handles and retainers are both available separately for replacement or size change and can be used on either gun. A variety of Cartridges and nozzles are available. 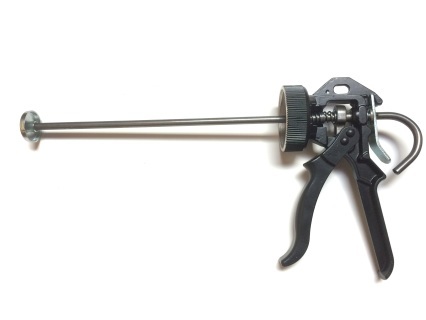 The IntelliSpense™ 1/10th Gallon (310 ML) Handheld Manual Cartridge Dispensing Gun Fits Most Standard Hardware Store Sizes For RTV, Silicone and Caulking Cartridges. While the 1/10th gallon or 310 ml/cc cartridge is the most common, there are many other sizes available. 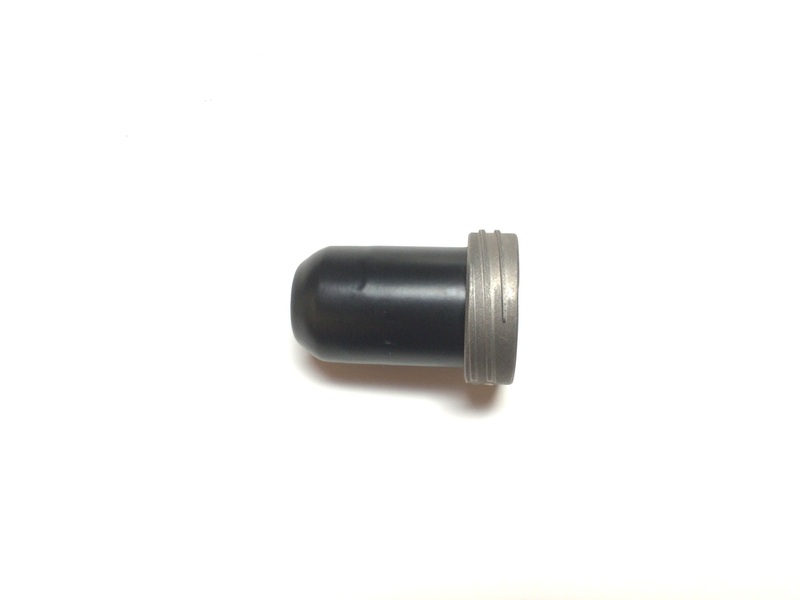 IDS offers empty cartridges, nozzles, tip and end caps. 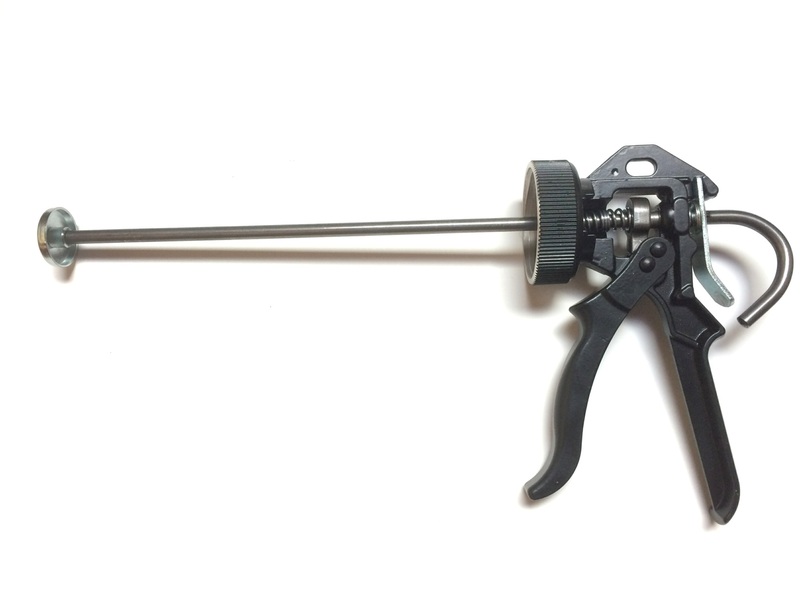 All IntelliSpense™ Pneumatic Air Guns come with a built-in metal ring at the top of the gun for use with a tool balancer to balance the weight of larger guns and cartridges that may be filled with thicker, heavier materials. Air exhaust release to reduces dripping and stringing. 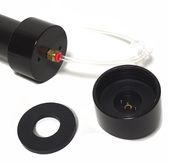 A variety of Cartridges and nozzles are available. 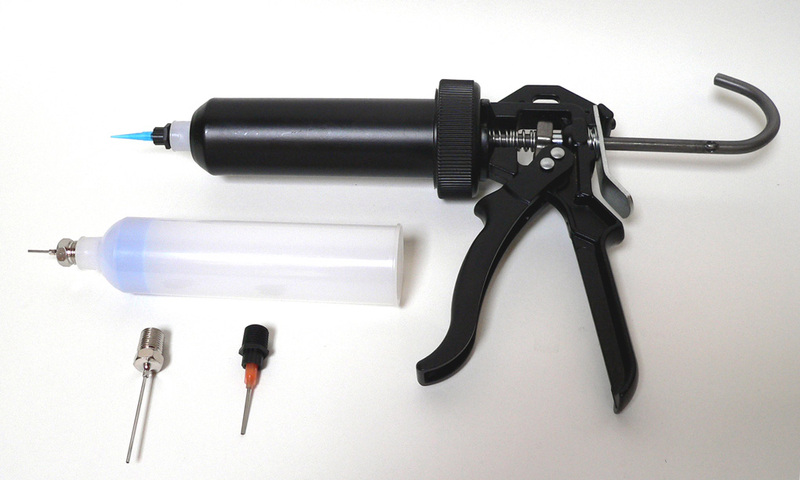 The IntelliSpense™ 1/10th Gallon (310 ML) Handheld Pneumatic Cartridge Dispensing Gun Fits Most Standard Hardware Store Sizes For RTV, Silicone and Caulking Cartridges. Our rugged metal cartridge retainers (shown , left) with heavy duty threads, work with both Pneumatic and Handheld guns to hold the filled cartridge securely in place. 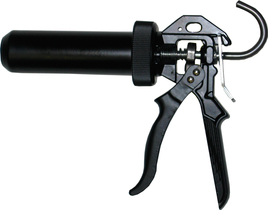 The Handler Pneumatic Cartridge Gun Set (shown above) and the Handler Manual Cartridge Gun accepts 2 1/2, 6, 8, 12 oz. and 1/10th Gallon threaded retainers that fit together to accept different sized cartridges, plungers and nozzles, which are ordered separately. See ordering information below. Metal cartridge retainers (shown left) with heavy duty threads hold your cartridge securely in place. Fill Cartridge with material or insert your own pre-filled cartridges (also available as an IDS special service) remove the retainer from the handle, and slide the filled cartridge inside. Replace retainer by screwing in flush. Do not over tighten. 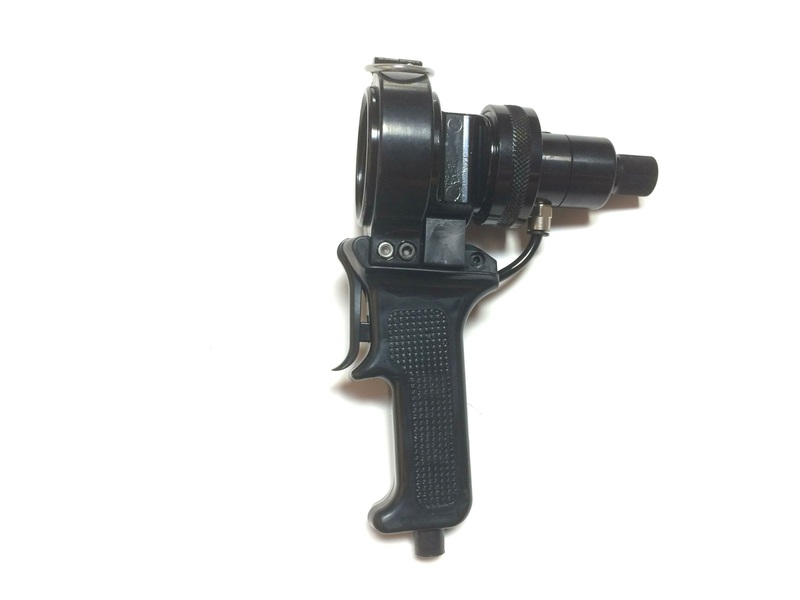 The air volume inside the gun will ensure a positive seal and you will reduce the possibility of stripping threads. The IntelliSpense Handler™ series offers both manual and pneumatic gun handles. The 3232321H is the small manual version, intended for use with 2.5 and 6 ounce only. This will not work with larger sizes. The IntelliSpense Handler™ series offers both manual and pneumatic gun handles. The 3232323H is the large manual version, intended for use with any IDS retainer. The IntelliSpense Handler™ series offers both manual and pneumatic gun handles. The 3232325HO is the pneumatic version, intended for use with any IDS retainer. 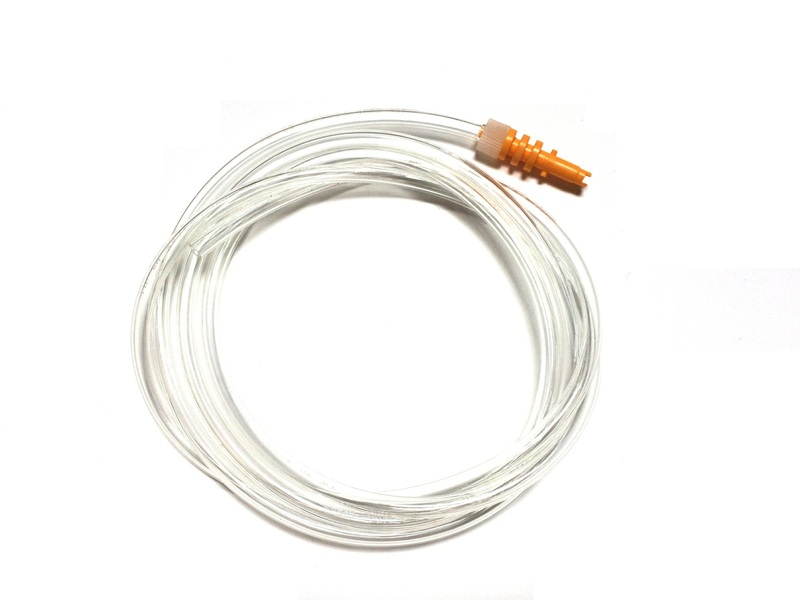 Threaded input allows you to directly attach an air line or add a 1/4" Quick Connect barb. Includes gasket. The IntelliSpense Handler™ series Pneumatic Cartridge Dispensing Guns and our Cap and Retainer assembly used in Cartridge Dispensing Stations. 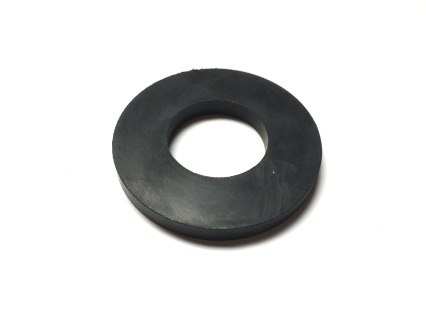 The 8880114 Pneumatic Retaining Cap And Gasket is intended for use with any IDS retainer. Requires a Retainer and a 8880359CA Air Supply Hose to attach to any IDS dispenser. The 1/4" Tube connection in the top makes for easy automation. The 8880359CA, Air Supply Hose for IDS Dispensers to Retainer Cap is intended for use with any IDS dispenser to connect to the 8880114 pneumatic cap. 3232329 = 2.5 oz. Retainer for 2.5 oz. cartridges. The 3232329, 2.5 oz. Retainer for 2.5 oz. volume cartridges is intended for use with any IDS cartridge handle or pneumatic cap. The retainer is built to fit the exact cartridge size. 3232330 = 6 oz. Retainer for 6 oz. cartridges. The 3232330, 6 oz. Retainer for 6 oz. 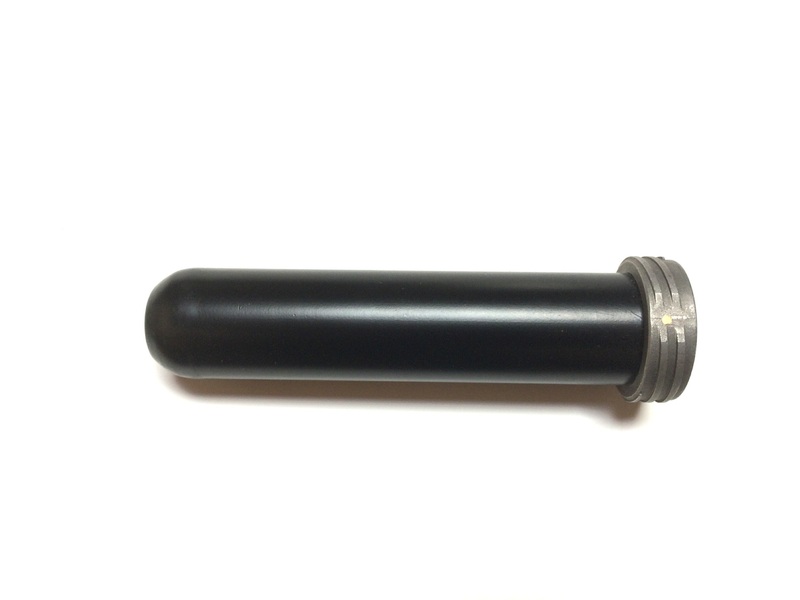 volume cartridges is intended for use with any IDS cartridge handle or pneumatic cap. The retainer is built to fit the exact cartridge size. 3232331 = 8 oz. Retainer for 8 oz. cartridges. The 3232331, 8 oz. Retainer for 8 oz. 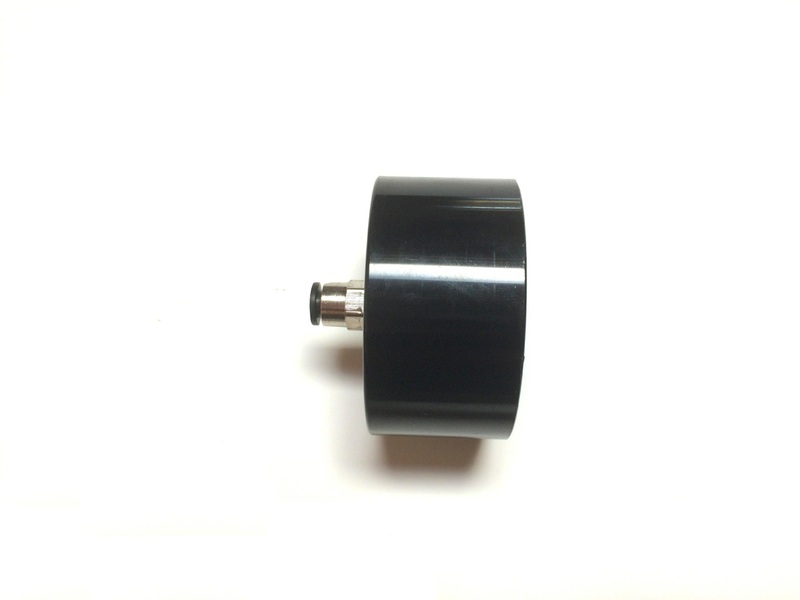 volume cartridges is intended for use with any IDS cartridge handle or pneumatic cap. The retainer is built to fit the exact cartridge size. 3232332 = 12 oz. Retainer for 12 oz. cartridges. The 3232332, 12 oz. Retainer for 12 oz. 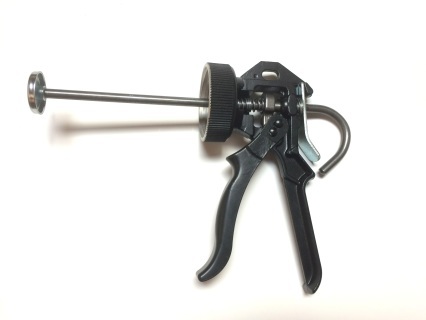 volume cartridges is intended for use with any IDS cartridge handle or pneumatic cap. The retainer is built to fit the exact cartridge size.